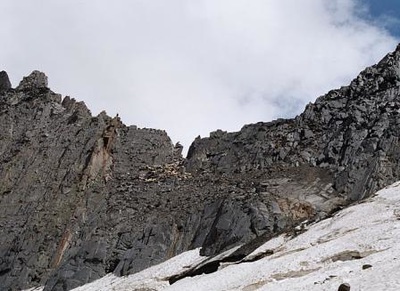 Chobia Pass is the second highest pass in the Pir- Panjal mountain range, an interesting and adventurous trek of 5-6 days over one of the toughest treks. 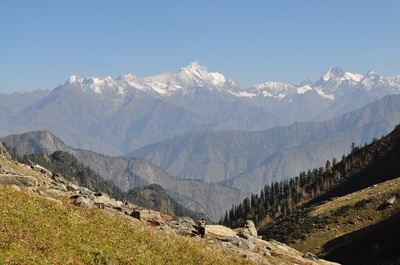 In this trek, tracker can view the beauty of Pir- Panjal range The Gaddies (shepherds) after spending six months in lower reaches of Kangra and Una District of Himachal Pradesh come to Bharmour, and move towards Lauhal and Spiti through Kugti and Chobia passes to graze their flocks. This Pass is very risky at the time of snowfall or over fresh snow for tracking as crevasses open up on Lahaul side in monsoon months and are difficult to negotiate. Gaddis also sacrifice few sheep’s when they are crossing Chobia Pass to the Goddess Marali for safe and easy crossing. Few of shepherd also cross another Pass in Lauhal known as Baralacha pass as grass of Lauhal and Spiti is much nutrient than other grasses; this is the main reason to go to Lauhal and Spiti with their flocks. June is the best month for trekking this pass. 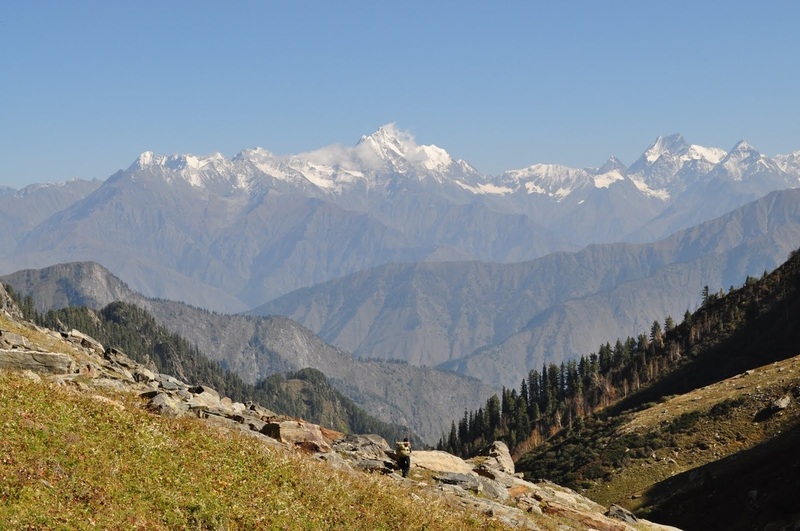 Chobia Pass lies between 2 minor peaks Tent Peak (6133m ) and Barakanda Peak (5877 ) of the Pir Panjal Ranges. We reach Chobia village from Bharmour on our Cars. From here we trek towards Katheru temple after crossing some water streams and then walk along the nallah towards the temple which is located near the chobia water stream. We camp here tonight. From Katheru temple we climb towards BaggiGot which is a campsite for shepherds and vast meadows welcome us. Thereafter there is a gradual ascent which leads to Alyas or Base camp where a rock overhang serves as a shelter. We camp here tonight. 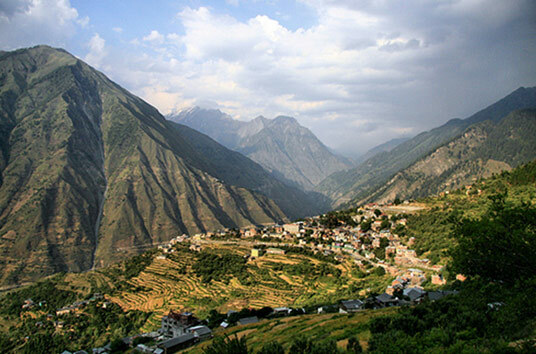 -Today we rest for acclimatization for the next day tiring journey and enjoy the splendid views. Today we start early as its a very long day and we aim to leave at 4am after light breakfast and packed lunches. 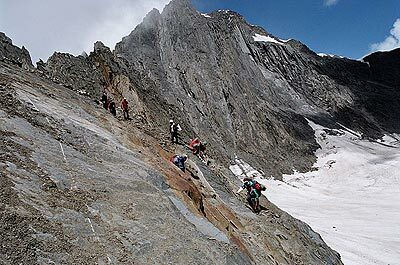 It takes 4-6 hours to reach the pass traversing through very difficult and challenging trail, and involves lot of climbing over snow. In post monsoon season there is thin frozen ice film on top of boulders which makes it all the more risky. 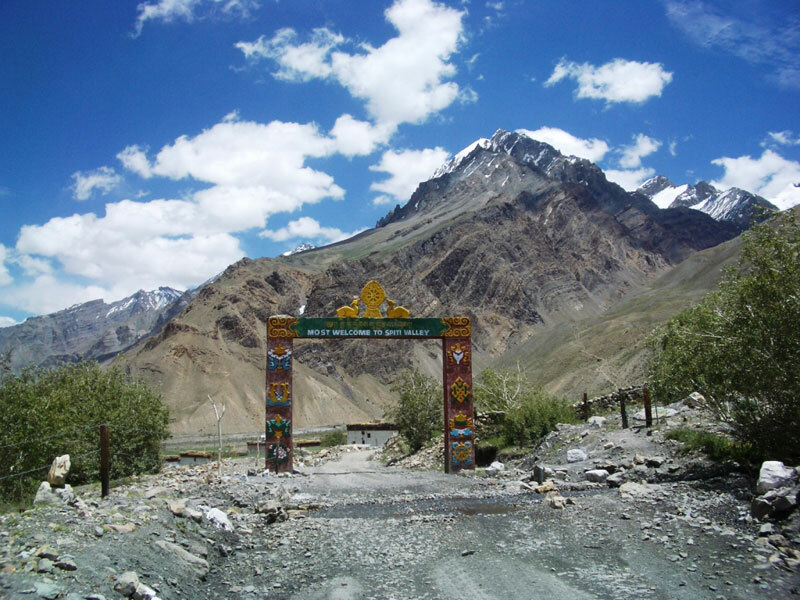 After much effort we reach top of the pass to rest and watch the magnificient views of Pir Panjal ranges on the North and Manimahesh Kailash towards the South. There is small lane between two vertical snow covered rock walls as the crossing. 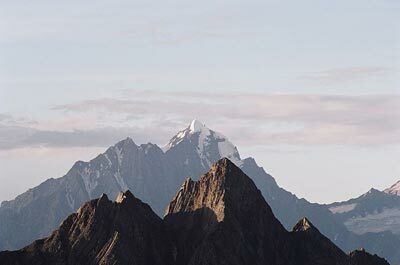 The descent from here is equally taxing and risky and needs careful guidance of a guide as the path will be unexpected over moraines and boulders. Also as its a crevasse area, so we need to be extra careful over this stretch. Nearly 4 kilometers of tiring descent is over ice covered boulders and snow. After a tiring descent we reach the second Alyas or Base camp II. We rest and click some pictures as there are rich pastures all around as we prepare to camp here tonight. Today is an easy descent as we reach Bhayali village of Lahaul on a well marked trail free of boulders. 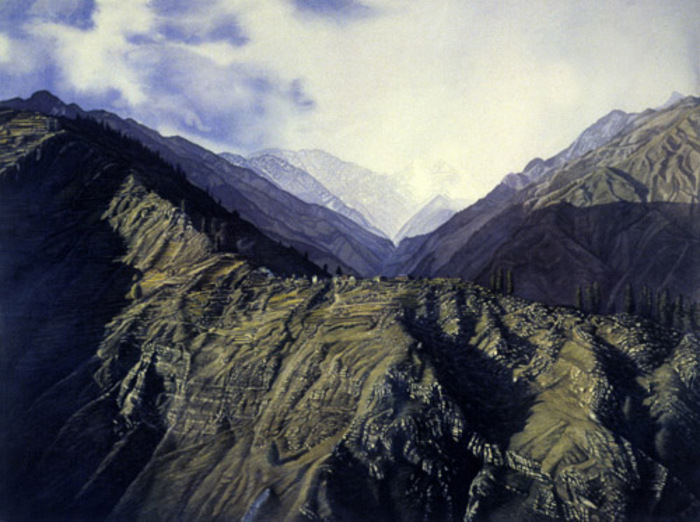 The trek passes through a deep gorge formed by huge mountains on both sides of Chobia Pass. From there the views are splendid. The village is located on a bridge near Chandrabhaga river. 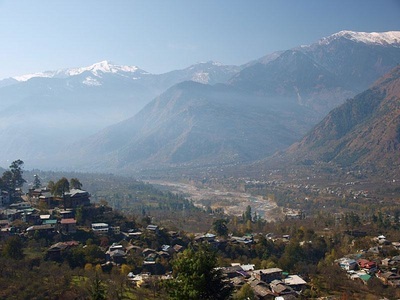 We experience the cultural difference between villagers of Lahaul and Bharmour which is very evident. 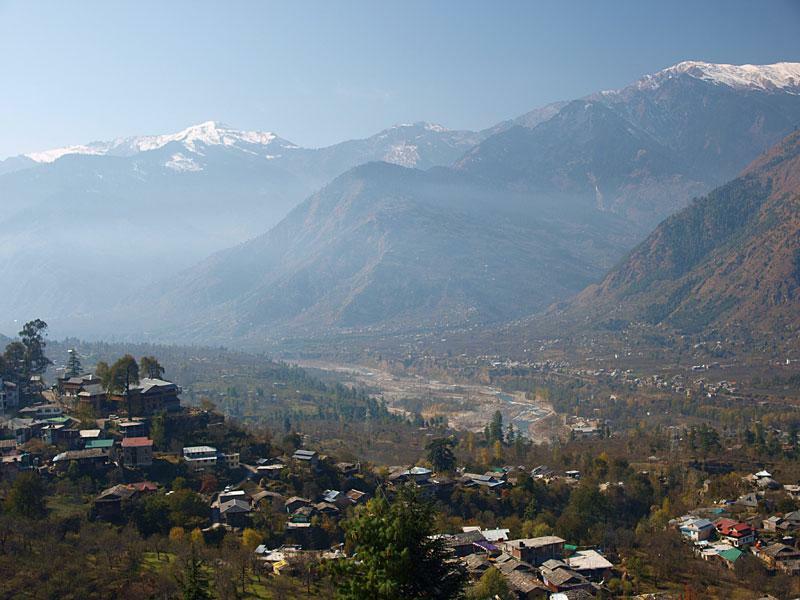 From here our cars will take us to our hotels in Keylong which is around 50 kms from here.